Written in clear and simple English to help leaders to run Discipleship Explored: Universal Edition. Essential for every leader. Written in clear and simple English to help the leader use straightforward English while guiding the group through the studies. This study includes weekly Bible studies, talk outlines and training material on how to unpack any deeper concepts that may arise. This Universal Edition Leader's Guide can be used in conjunction with both the Universal Edition Study Guide and the International Student Study Guide. 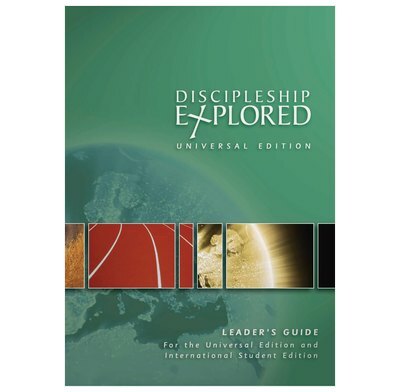 The Discipleship Explored: Universal Edition features a series of Bible studies through Philippians which can be used on their own, or in conjunction with the Discipleship Explored DVD. The studies are designed to be universally accessible with a special emphasis on clear and simple English, making them suitable for use with internationals who are learning English and for anyone else who appreciates really clear and simple language. The Bible studies could also be used in regular Bible-study groups or with anyone who has recently completed a Christianity Explored course. - Additional resource material available as free downloads. 5.8" x 8.3" x 0.2"
Sheets with each week's Bible passage printed on them (one sheet per week) - to allow group members to make notes on the passage, underline repeated words or themes etc. An Optional Introductory Session to help the group find out about the background of the book of Philippians and learn how to study a New Testament letter. Optional Bible Readings for home use between the weekly group meetings. Copies of each week's Word List from the Bible passage so that they can be printed out or projected via Powerpoint or an OHP. A good guide book for discipleship training both in a group or personal. A good training tool for growth in discipleship after completing the Christian Explored training course.